Cold it might be, but there's plenty to make this season enjoyable in Le Marche - welcome to the winter edition of the Marche Voyager Newsletter. And there's just time to wish you all a Buon Natale e Sereno Anno Nuovo. Ten years ago we wrote about the annual slaughter of the family pig in the region's country areas and now feel it's worth reprinting it. Once more the wine award season has brought an abundance of prizes for winemakers in the Marche. A total of seventeen wines managed to win Gambero Rosso's prestigious Tre Bicchiere awards for Italy's finest wines for 2015, eleven of which are outstanding examples of verdicchio. The Touring Club Italiano has now awarded 19 of its prestigious "Orange Flag" awards to Marche towns. The Bandiere Arancioni Touring are given to small inland comuni across Italy in recognition of the quality of what they offer the tourist while not sacrificing the environment. The scheme was launched by the TCI, Italy's leading independent tourism association, in 1999 to give an incentive to smaller corners, away from the country's better known coastal resorts, who take their visitors seriously. The Marche towns given the award are Acquaviva Picena (AP), Camerino (MC), Corinaldo (AN), Genga (AN), Gradara (PU), Mercatello sul Metauro (PU), Mondavio (PU), Montecassiano (MC), Montelupone (MC), Monterubbiano (FM), Offagna (AN), Ostra (AN), Pievebovigliana (MC), Ripatransone (AP), San Ginesio (MC), Sarnano (MC), Staffolo (AN), Urbisaglia (MC), and Visso (MC). 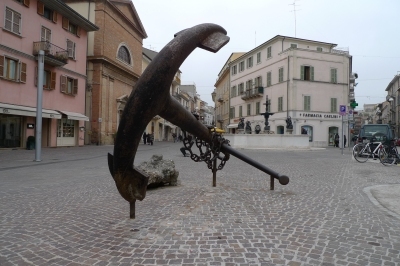 This month's image of one of the region's piazze, or town squares, features Piazza Matteotti in the seaside resort of San Benedetto del Tronto in Ascoli Piceno province, with a suitably nautical flavour. As well as regular flights to London from Ancona airport, Ryanair are also flying to Brussels, Dusseldorf and Stockholm from the Marche airport. Within Italy they also serve Alghero in Sardinia and Trapani in Sicily. The regional tourism authority has just released it's latest glossy video advert for the Marche featuring the celebrated Italian actor Neri Marcorè - you can catch it on YouTube. There are still a few weeks to catch the major exhibition of high medieval art in Fabriano, Ancona province. Entitled From Giotto to Gentile - Painting and Sculpture at Fabriano from the 13th and 14th Century, the exhibition has been extended until 18 January 2015. If you're planning to visit Le Marche next summer, Macerata's spectacular 2015 open-air opera festival in July and August includes Verdi's Rigoletto and Puccini's La Bohème. Pesaro's prestigious Rossini Opera Festival in August includes Rossini's La Gazzetta and La Gazza Ladra. Prices for a taste of white truffle (Tuber magnatum pico) dropped dramatically this year thanks to a very wet and warm summer. According to the Acqualagna Borsa del tartufo, or Truffle Exchange, the price for these delicacies is less than half the 2013 price, Euro 700 - 1,500 a kilo rather than 3,500. Guercino's painting of "The Guardian Angel" in Fano's museo civico inspired Robert Browning to write his homonymous poem.